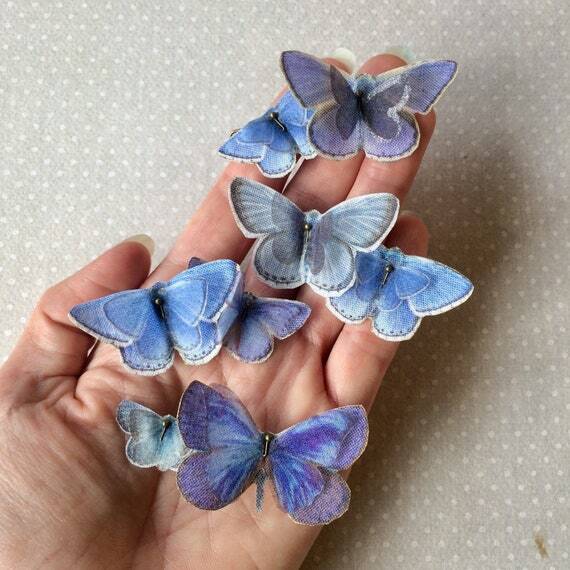 Lovely hand-made hairclips, hair clips with blue shades butterflies. 4 pieces. Butterflies hair clips are delicate. You can wear them on your hair every day but don’t stretch butterflies, don’t wash (also if they are waterproof). There are 4 butterflies on each hair clip: two in cotton and two in silk organza. Each hair clip measure 6 to 7 cm with antique bronze clip. 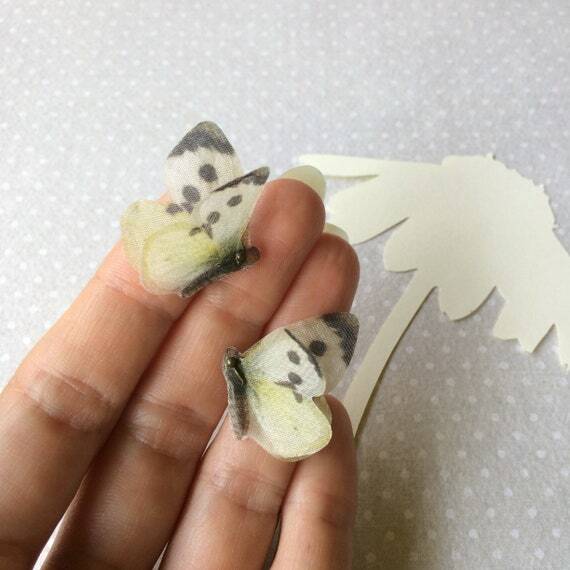 Completely hand-made stud earrings with white and ivory butterflies (Pieris Rapae). One pair. I choose butterfly images from real pictures and vintage illustrations. Then I print them on high quality silk, hand-cut one by one and seal to prevent fabric fraying. Don’t stretch, don’t wash and don’t spray perfume over butterflies. 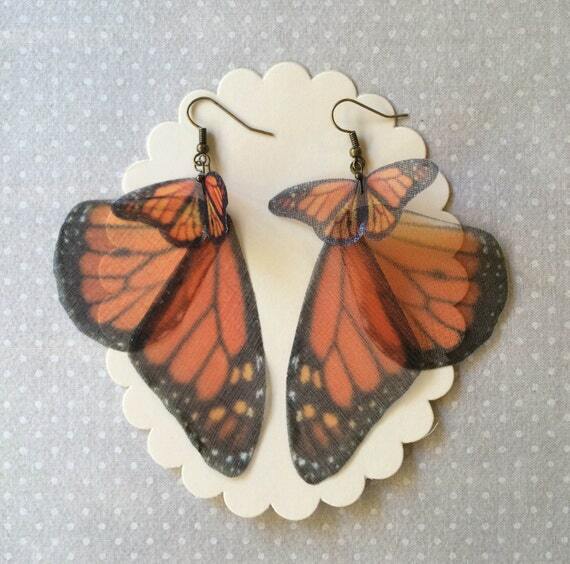 There are 2 butterfly layers on each earring, one in silk and one in silk organza. Butterfly measure about 2.5 x 3 cm with steel stud earrings. to complete the Monarch look! Thank you! The band is thin 1.5 mm. You can choose between copper, copper silver plated or sterling silver 925. 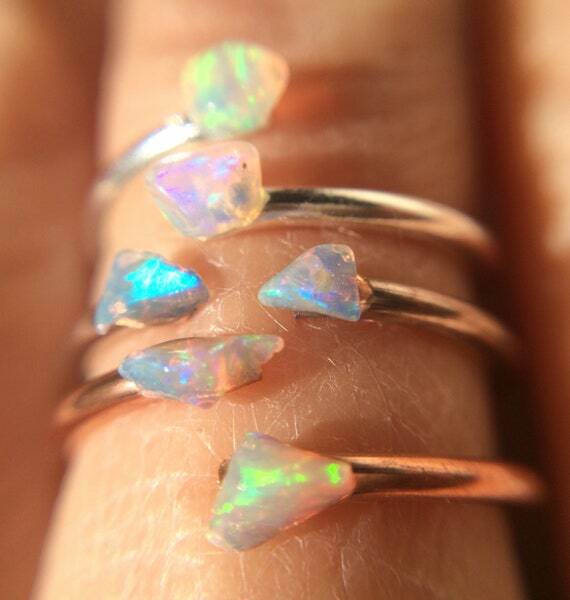 Wearing copper, or copper silver plated, has several important benefits: First, copper is an essential mineral for humans, and wearing copper jewelry has the benefit of slow copper absorption- perfect for proper assimilation. It’s also been claimed that headaches, arthritis and joint pain. I’m in love with this unique, one of a kind, creation! It’s a completely hand-made bracelet cuff wrist corsage, perfect for a special occasion.. your wedding day maybe, or for everyday use! I choose butterfly and moth images from real pictures and vintage illustrations. Then I print them on high quality silk organza and cotton, hand-cut one by one and I seal edges to prevent fraying. 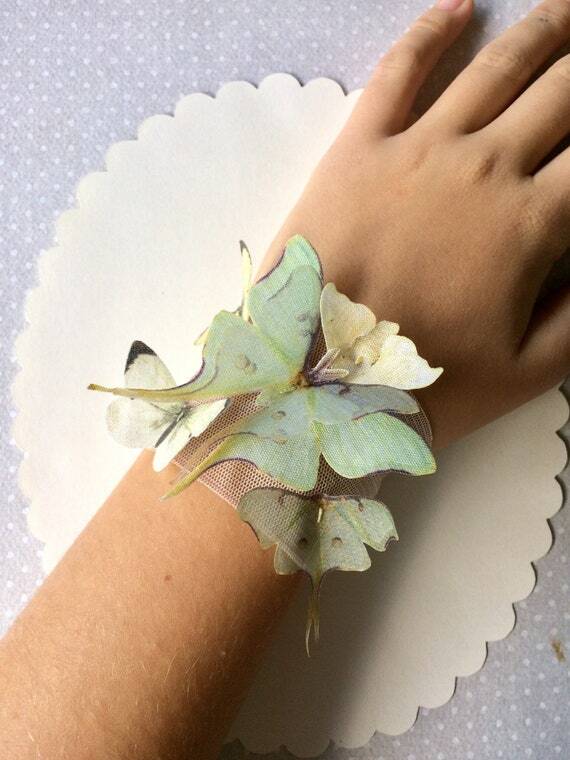 On this nylon elastic bracelet cuff there are 6 butterflies in cotton and silk organza. They measure from 3 to 6.5 cm each one. Every fabric piece is hand-sewn! If you need a smaller or larger size please contact me before to buy. I’ll ship the bracelet cuff gift wrapped, for you or your loved one. 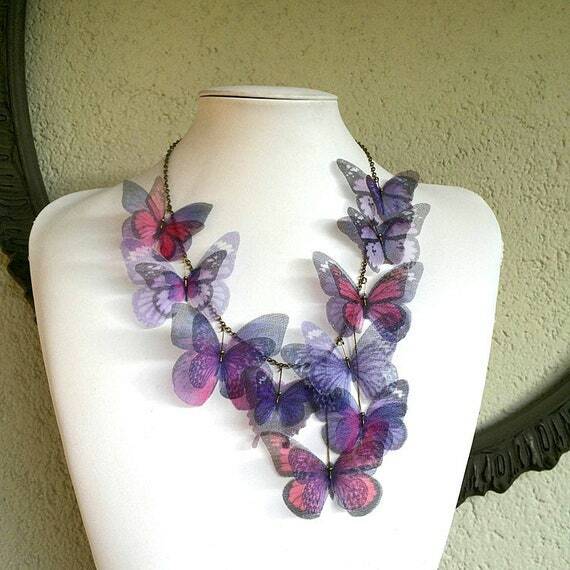 Completely handmade, statement necklace, with purple lilac lavender and pink fucsia silk organza butterflies. There are 21 butterflies on this bib necklace and each one measure from 3 to 8 cm. Antique bronze (or silver) chain is long about 45 cm. (18 inches) with lobster clasp.